Sickle cell anemia, the first genetic disorder recognized by medicine, is still not well understood. Identified in 1910 by James B. Harrick in Chicago, the disease affects close to 100,000 people in the United States, mostly African American, and millions worldwide. The consequences for patients are devastating. With no objective measure of the disease, Lanzkron said patients are frequently stigmatized when they seek medical attention — being mistaken for addicts in search of narcotics — and treated with disdain by emergency-room personnel unfamiliar with the disorder. The physiological consequences of sickle cell anemia include severe damage to organ systems, particularly to the kidneys and lungs, and can reduce life expectancy for those with sickle cell to the mid-40s. Complications include life-threatening infections and stroke — even in young children. Children who suffer intermittent attacks miss school with predictable consequences for their lives and for their futures. Meanwhile, their caregivers must miss work to tend to them. Added to this are the health-care costs. Sickle cell patients, Lanzkron said, are often “understandably depressed." But researchers are targeting the disease with new multidisciplinary approaches with promising results. Combining a novel chemotherapy protocol with a proven bone marrow transplant technique, Robert Brodsky, director of the hematology division at Johns Hopkins University Medicine, announced the cure [see correction below] of an adult sickle cell anemia patient — Pamela Newton of Capitol Heights, Md. And researchers with the National Institutes of Health have developed innovative techniques spanning the spectrum from chemotherapy to irradiation to move step-by-step towards a cure for sickle cell and related disorders. Normal red blood cells are disk-shaped and flexible, explained Lanzkron, allowing them to squeeze through tiny capillaries to bring oxygen and nutrients into every part of the body. Lanzkron elaborated: “People carrying the trait can still get malaria, but they are less likely to die from it.” But, she said, “There is no harm in having the trait,” which is carried by a recessive gene. However, when two parents have the trait, their offspring each have a one-in-four chance of having sickle-cell disease. Although mostly associated with blacks in the United States, the disorder is also seen among Latinos, Asians and others with Mediterranean or African ancestry. Aside from the not-always-effective pain medications, only two approved treatments exist for sickle cell, Jordan said — the chemotherapy drug hydroxyurea to ameliorate crises and bone marrow transplant. Bone marrow transplants have been recognized as a cure for sickle cell for more than 20 years, but they have always required a perfect tissue match between the donor and the recipient. Only siblings can meet that requirement, and even then, the odds are one in four of a perfect match. However, because sickle cell is hereditary, closely matched siblings also have a high probability of sharing the disorder. Lanzkron describes a lifesaving operation: “We give the patient agents that knock out the bone marrow; then it’s like getting a transfusion. We harvest a bit of marrow from the donor and infuse it into the patient. “The bone marrow cells do the rest. They know where to go.” It sounds deceptively simple, but Lanzkron says that a bone marrow transplant has between a 10 percent to 20 percent mortality rate. Although the procedure has been used to cure the disease in about 200 patients — all of them children — bone marrow transplant is so problematic in adults that it is rarely attempted except in life-threatening circumstances. “It is very difficult for adults to embark on a transplant course because, by that time, they have experienced so many transfusions that finding a match in itself is a challenge,” Jordan explained. Furthermore, in adulthood, mounting complications and decades of organ damage may render patients too fragile to withstand the chemotherapy required to make it work. Over the past year, important advances have been made both in widening the pool of potential marrow donors and in lowering the risks of bone marrow transplant. The intensive chemotherapy regimen, employed up until the 1990s to make way for bone marrow transplants, destroys the patient’s native bone marrow so that a graft can take root. But if the graft fails, the patient, with his own marrow obliterated, can no longer produce new blood cells and must be re-transplanted immediately in order to survive. But this scenario is turning around dramatically thanks to Brodsky&apos;s innovative technique developed at Johns Hopkins. Brodsky and his team, who reported the first adult cure in May of last year, took a new approach by utilizing a less toxic chemotherapy regime than customarily used for bone marrow transplants. It employs just enough chemotherapy to prevent the patient&apos;s immune system from rejecting the donated stem cells while preserving as much of the patient&apos;s bone marrow as possible. Three days after the bone marrow transplant, doctors dose the patient with the drug cyclophosphamide to kill off the donor’s lymphocytes (white blood cells that attack foreign cells) before they can begin an attack upon the body of their new host. 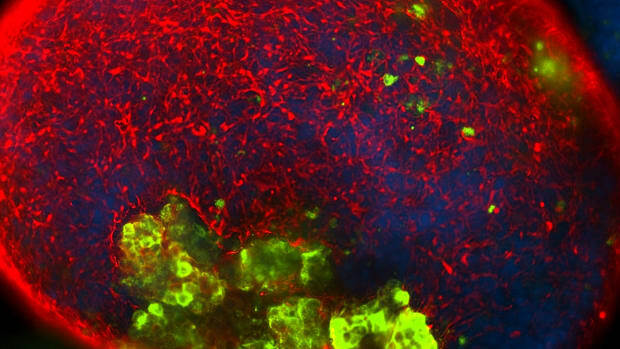 This combination therapy gives the recipient patient&apos;s new stem cells a chance to establish themselves in the bone marrow and begin producing healthy blood cells while a compatible — and home-grown — immune system develops. Most significantly, Brodsky said the procedure allows for transplants not only between fully matched siblings, but also between half-matched pairs, expanding the potential donor pool to parents and other relatives. Jonathan Powell, a National Institutes of Health research fellow, has been collaborating with Dr. John Tisdale at NIH on a different approach, which shows promise not only for sickle cell, but also for thalassemia, Diamond-Blackfan anemia and other severe congenital blood disorders. Following Tisdale and Powell’s protocol, the donor receives specialized chemotherapy for five days with injections of G-CSF, an agent that stimulates white blood cell formation, to prepare the marrow for transplantation. The cells, once harvested, are frozen for five months before being infused into the patient. Patients undergo their own course of immune suppressing chemotherapy, and are given a single dose of full-body radiation to retard the immune system’s response to the donated stem cells. According to Powell, 10 of the 11 people with sickle cell anemia who have undergone this procedure have taken well to the grafts. And in both studies, failure is not necessarily of dire consequence. Javier Bolaños-Meade, assistant professor of oncology at Johns Hopkins, says with the reduced chemotherapy approach used by both NIH and Hopkins, “the worst case scenario is that the transplant doesn’t take — then we’re back to square one and the person ends up still having sickle cell,” but their bone marrow recovers and they can survive to try an alternative therapy. Powell said NIH’s results have been promising “not in numbers, but in the positive response the patients have had. It shows that we’re on the right track. In January 2009, NIH’s bone marrow transplant study was expanded to include not only fully matched adults, but also children and half-matched donor/recipient pairs, and recruitment for these new participants is currently under way; likewise for an ongoing study at Hopkins. *Correction: In an earlier version, we said that Johns Hopkins researcher Robert Brodsky and his colleagues developed "the first-ever cure of an adult sickle cell anemia patient." Dr. Brodsky says that Pamela Newton was cured, but her case is not the first ever adult cure for sickle cell — other adult patients have successfully received bone marrow transplants and been cured. The approach being developed at Johns Hopkins potentially allows for broader application of bone marrow transplants to cure sickle cell. Brodsky notes that this new technique, used for the first time on Ms. Newton, was probably the first successful haploidentical bone marrow transplant for sickle cell — he&apos;s unaware of others, but he&apos;s not 100 percent certain that there aren&apos;t more out there.